4BR Luxury Lakefront Cottage La Casa Resort Kelowna Sleeps up to 10! 4 BR Cottage at La Casa Resort. This property is right at the very bottom and only a few steps down to the boat launch and beach. 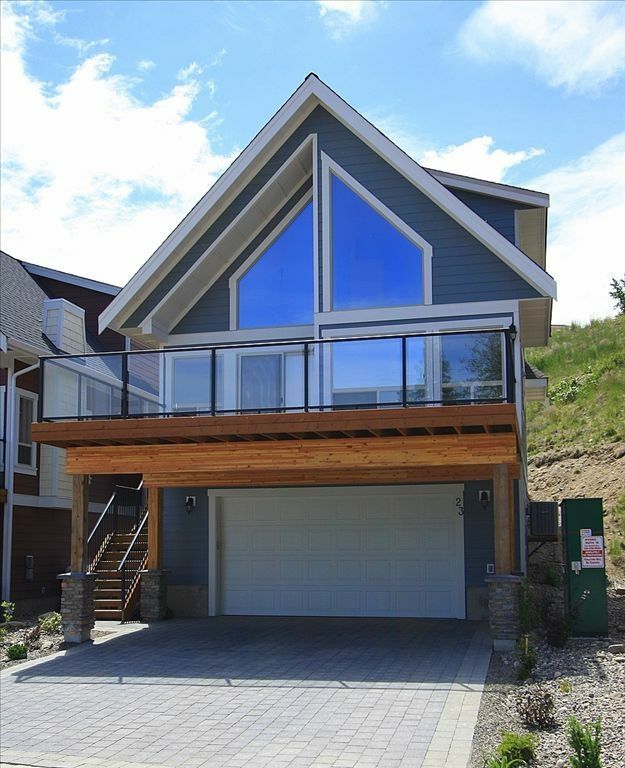 Enjoy the fantastic unobstructed views of Lake Okanagan on the oversized front deck. Later in the day, there's also a back deck should you choose to follow the sun. This unit will easily sleep 3 couples and there's another small den/office where a couple of small children could sleep. Only recently completed it has stainless steel appliances throughout, Sealy beds, a 37' Toshiba LCD TV, Sony DVD Home Theatre and a 78,000 BTU Gas BBQ. 4th Bedroom recently added with 2 twin beds suitable for 2 children. Perfect for families that want to get away and relax. At the resort there is also a community pool and Jacuzzi, mini golf course, children's play area, general store and restaurant. For those who enjoy wine, local British Columbia wineries offer fantastic wine tours and wine tastings. There are over fourteen wineries within a one hour drive of LaCasa Resort including Mission Hill, Summer hill Pyramid Winery, and Gray Monk Cellars. Kelowna hosts a Spring and Fall Wine Festival accompanied by great food and unique events. In the winter there is tons of great skiing nearby. La Casa Resort is about an hour away from Big White Ski Resort and Silver Star Mountain Resort. If you're into hiking or ATV'ing. There's several great trails at the back of the resort that will keep you occupied for hours. Beautiful spot! We enjoyed ourselves so much ! Very nice place and location. Unfortunately it was short a few necessities such as toilet paper, dishwasher soap, and towels with which to dry the dishes. Although an email was sent regarding these over sites, the deficiencies were not rectified. Lovely cottage with a great view. The cottage is in a great location with a beautiful view. We were a group of five ladies for a weekend away, and the single beds worked for our needs, although more geared for children. We really enjoyed the balcony and the "walk" up to the pool. I would echo another reviewer's suggestion for darker curtains, and the loft bedroom is especially bright as it is open to the large front windows. I found the information provided by the owner very detailed. He was very responsive to my emails. La Casa also sent information via email which was helpful. I would highly this cottage for a group of adults, or a family. Perfect home away from home! Such amazing amenities and just a short walk away! It was a perfect spot for a staycation! We were a family of 8 (2 babies, 2 toddlers, 4 adults )We live in Peachland so it wasn't far. Felt like we were farther. The house had everything we needed. It was clean and comfortable. The owners sent clear instructions on how to run the tematurr, BBQ, where the garbage is etc. They were extremely informative so we didn't need to try and figure things out. We would stay there again in a heartbeat! We enjoyed our stay at La Casa Cottage. The amenities around this resort are great and the view of the lake is spectacular. La Casa Cottages is located about 40 min away from Kelowna and Vernon. Make sure that you buy all of your groceries and things you may need beforehand. The road leading to the area is extremely windy - heads up if you get motion sick! -Bedrooms are very bright! Darker blinds/dark curtains in the bedrooms would be very beneficial. The upstairs loft is quite bright in the early morning as the large windows face the morning sun and there are no blinds. -The "fourth bedroom" really can't be advertised as a bedroom as it does not have a door. -The pool and other amenities are quite far from the house. We had to drive our cars up to this area every time we wanted to use it. Pool was quite busy the times we were there. The cottage area could really use another one, or a bigger pool. Glad you enjoyed your stay and thank you for the feedback! We've always been early risers so the morning sun is always nice for us, but we will definitely take your blind suggestion into account for next season! The 4th bedroom is really meant to be a children's room with two twin beds. It's not intended for adults although people are free to use it for that purpose. We chose the bottom of the resort to be close to the lake as it is perfect location to be close to the marina and a 5 min walk down to the lake. There is also another pool area up top although smaller than the main one. Mid summer is a very busy time throughout the Okanagan. Glad you enjoyed your stay!! A great location for a family reunion! We all loved the cottage and the location! There were 2 children aged 4 & 8 and they especially liked the pools and hot tubs. The fact that they were heated was a real plus. The cabin held 5 adults as well and there was plenty of room. The view from the balcony was spectacular and such a short distance walk to the lake. Overall, we had an excellent time. Thanks!